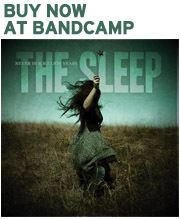 The Sleep is an alternative electronic band based in the American Midwest and consists of Laura Smith on vocals, Dave Eberhardt on guitars, and Neil Smith on keyboards and electronics. Neil has been self-producing electronic music online for years. Dave is a well-known guitarist, having played with the Katie Reider Band, singer-songwriter Holly Spears and with his own band The Moodrings. Laura is making her musical debut with The Sleep writing lyrics and singing lead vocals. The Sleep’s first release, Never in a Million Years, is an 11 song album of dark and haunting music. It is released independently through WORKSMITH, an analog and digital media project developed by Neil and Laura. Additional musicians on the album are Tony Miracle and Will Crewdson. Tony is a member of the electronic band Venus Hum and records solo projects under the name Satellite City. Will has worked with such diverse acts as Rachel Stamp, Johnette Napolitano and Dragons.